The goal of this website is to help you to make an informed decision on the program you would use to self-learn Mandarin Chinese from home. After a thorough review, we have found that Rocket Chinese is the best option, considering cost, value and amount of material included in the package. 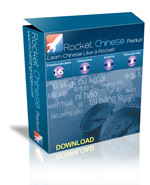 All in all, Rocket Chinese is our recommendation for new students that want to achieve an intermediate level of proficiency. Pimsleur Chinese a classic resource that any serious self-learning student should take into account. This method was developed by Dr. Pimsleur as a result of many years of language-learning scientific research. He concluded that humans learn by listening and trying to talk repeating the words and phrases the just listened. He also discovered that if we try to answer questions with the Chinese words already learned, given certain time periods, we tend to learn quicker and the knowledge lasts longer in our memory. To learn from Pimsleur method, you would need 25 minutes a day preferably without distractions, in an environment where you are able to respond in loud voice. There are several online retailers who sell Pimsleur Mandarin Chinese, although we have found that the best buying experience, warranty and customer service is being offered by Amazon.com. Order your Pimsleur Chinese Program from Amazon.com . This site offers a lot of options, some with a small amount of lessons, some with more lessons at different price points starting from $23.95 (5 lessons). NEW: The link above lists all products in digital downloadable format so no shipping and handling charge applies.